Payment gateways are the middlemen that connect your ecommerce shopping cart to your payment processor to enable online credit card payments. We looked at the most popular options and rising stars and decided to review PayPal, Stripe, and Authorize.Net. These companies covered the range for small businesses in terms of security, ease-of-use, payment processing options, and price. Choosing the best payment gateway for your business is extremely important, but you also need ensure that it’s compatible with your website. Volusion is an eCommerce software that helps you to set up an online store that integrates with PayPal, Stripe, and Authorize.Net. It also helps you manage your website, sell your items, and market your business. Click here to start a free 14-day trial. Read on for our comparison and review of these 3 payment gateway options, as well as our top recommendations. We recommend PayPal as the best payment gateway for small business because they have a payment plan to fit every possible online selling need, from startups to power sellers. Plus, every plan lets you easily accept PayPal payments which can significantly increase conversion rates over online stores that don’t. PayPal is our top payment gateway choice for small businesses because its total of five payment gateway plans fit any online selling need imaginable. Plus, with every plan you’re able to accept PayPal payments. This is notable since accepting PayPal drives a 44% higher conversion rate over stores that don’t accept PayPal, according to Nieslen’s Online Buyer Insights. Add to this universal name recognition and positive reputation among buyers, and it’s pretty hard to top PayPal when comparing online payment gateways. PayPal is best-known for its three all-in-one payment services: Payments Standard, Payments Advanced, and Payments Pro. Each conveniently rolls credit card processing and a payment gateway into one complete service and charges a competitive rate of 2.9% + 30¢ per transaction. Through these plans, PayPal delivers a range of all-in-one services tailored to fit the needs of startups and large sellers alike. This is in contrast to the single all-in-one plans that Stripe and Authorize.Net offer. Along with its all-in-one plans, PayPal also offers two traditional payment gateway plans called PayFlow Link and PayFlow Pro. Each PayFlow plan provides your payment gateway, but lets you use a third-party merchant services provider for credit card processing. If you sell more than $8k/mo. or so, this is worth considering since third-party merchant services can offer lower processing rates than PayPal’s all-in-one plans. In this, PayPal and Authorize.Net are comparable since both offer all-in-one and traditional gateway options. However, PayPal’s PayFlow plans give you the added benefit of built-in PayPal payments too, which is something Authorize.Net can’t match. Stripe doesn’t compete in this arena at all since they only offer an all-in-one plan. The beauty of PayPal is twofold. First, it provides the widest array of payment gateway plans. And second, each plan accepts PayPal payments. Now, most shopping carts let you accept PayPal payments alongside Stripe, Authorize.Net, or another payment gateway, but you have to integrate them separately then manage two accounts. If a large percentage of your buyers pay using PayPal, it’s easier to manage just the one payment service, especially since you have your pick of many plans. On the downside, certain PayPal plans carry monthly fees, which is also true of Authorize.Net. Here, Stripe tops both with no monthly fees. Another consideration is checkout security. Certain PayPal plans handle checkout security and PCI compliance for you, while others leave that responsibility to you. We cover which plans do this in detail below. In this aspect, Authorize.Net and PayPal are alike, but Stripe beats them both with a fully secure checkout, period. Stripe handily beats our other top picks when it comes to worry-free checkout security. While certain PayPal and Authorize.Net integrations leave checkout security to you, Stripe shoulders that responsibility. To ensure this, Stripe always hosts the payment portion of the checkout themselves. This way, payment information is entered directly into Stripe’s secure server and never touches your store’s data. That’s why we name them the most secure payment gateway for 2017. Along with being tops in security, Stripe offers a surprising number of useful features. It accepts over 100 currencies, supports ApplePay, AndroidPay, and even Bitcoin, and has a terrific mobile app, to name just a few. But what will never surprise you is the cost. Stripe has the simplest pricing structure of our three picks. Stripe charges a flat-rate of 2.9% + 30¢ per transaction, and that’s it for all of its services. No monthly fees, no add-ons for recurring payments or declined charges. In fact, the only other fee you might encounter is their $15 chargeback fee, which is the lowest of the three. But even that is refunded if the charge is decided in your favor. Where Stripe falls short of our other two is in merchant account options; there are none. Stripe is an all-in-one payment provider, period. This means that you can’t pair Stripe’s gateway with your own merchant services provider to garner lower credit card processing rates. Here, PayPal and Authorize.Net are more versatile since you can use a third-party merchant account with their traditional payment gateways. That said, the hassle-free all-in-one simplicity of Stripe is exactly what many small businesses need. Stripe plugs-and-plays with 51 top ecommerce shopping carts, so it likely works with yours. While PayPal and Authorize.Net both plug-and-play with more carts, Stripe’s secure API lets it connect to virtually any cart, and even be fully customized by a programmer. But for most small businesses, Stripe’s one-click connection with 51 carts and standard features fills every payment processing need. Authorize.Net has been around since the early days of ecommerce, so naturally it works with just about any merchant services provider imaginable. It’s actually the preferred gateway partner of many top payment processors and banks including Dharma, Flagship, Wells Fargo, Chase, and plenty more. What this means is these merchant services bundle a gateway together in their processing packages. And that gateway is Authorize.Net. In classic gateway functionality, Authorize.Net is similar to PayPal’s traditional gateway options. Each is the middleman between your site’s checkout and your payment processor. But there’s one major difference — ease of getting started. If you want to use PayPal’s traditional gateway, you need to find a merchant services provider that supports it. PayPal states that most do, but they don’t provide you a list. If you already have a merchant services account, that’s a simple call to your provider. But if not, you have to hunt down your own payments processor. In contrast, Authorize.Net readily works with just about every processor, plus provides you an extensive partner list. So in terms of a gateway with your own merchant account, it can be easier to get started with Authorize.Net over PayPal. If you process around $8k per month in credit cards or more, you likely can save money going with a gateway/merchant account combo through Authorize.Net or PayPal’s PayFlow, instead of an all-in-one solution. But you definitely need to understand how credit card processing works when considering this route, though. There are more fees involved with this processing option, but the right processor can save you money. You can see a comparison of merchant solutions providers here. That said, Authorize.Net has recently joined the all-in-one bandwagon, too, and now offers a quick-start, flat-rate payment solution comparable to Stripe and PayPal. However, Authorize.Net tacks on monthly fees, a setup fee, and doesn’t readily handle end-to-end security like Stripe does with all accounts, and PayPal does with some. If a simple, flat-rate payment solution is right for you, Stripe and PayPal both are better all-in-one choices than Authorize.Net. Payment gateways generally charge two types of account fees: per-transaction fees and, for some, monthly fees. Stripe’s pricing is the simplest of our three top picks, while PayPal and Authorize.Net have varying plan-based charges. Read on to see how they all stack up. Some PayPal accounts offer more features than others, and these come with monthly fees. 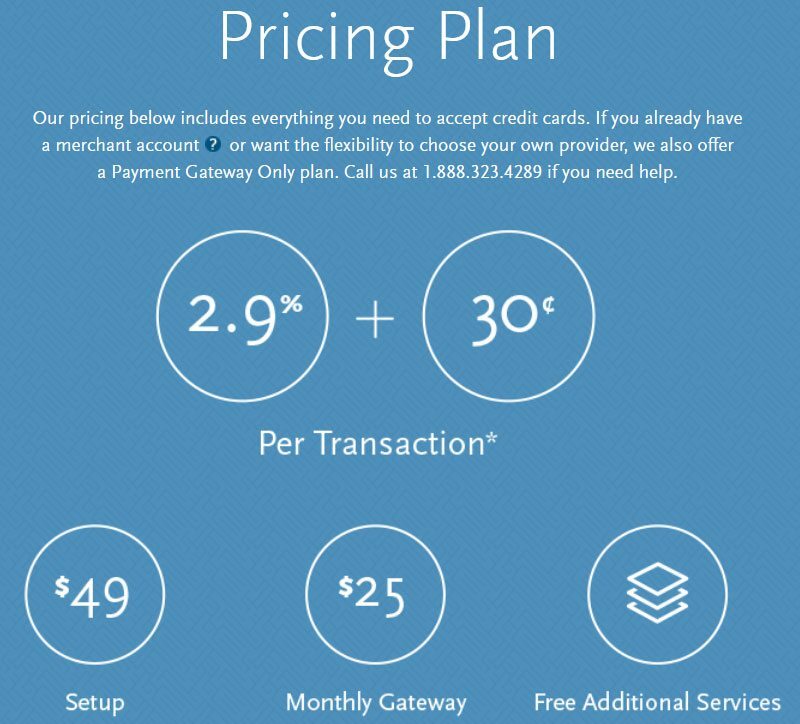 So, if you’re considering PayPal as your payment gateway, be sure to compare features and fees for each of their plans because there are some differences. PayPal’s all-in-one plans handle all of your credit card processing needs and charge PayPal’s basic 2.9% + 30¢ per transaction fee for this. Two of these plans provide added features and those come with monthly fees. You can compare all plan features here. 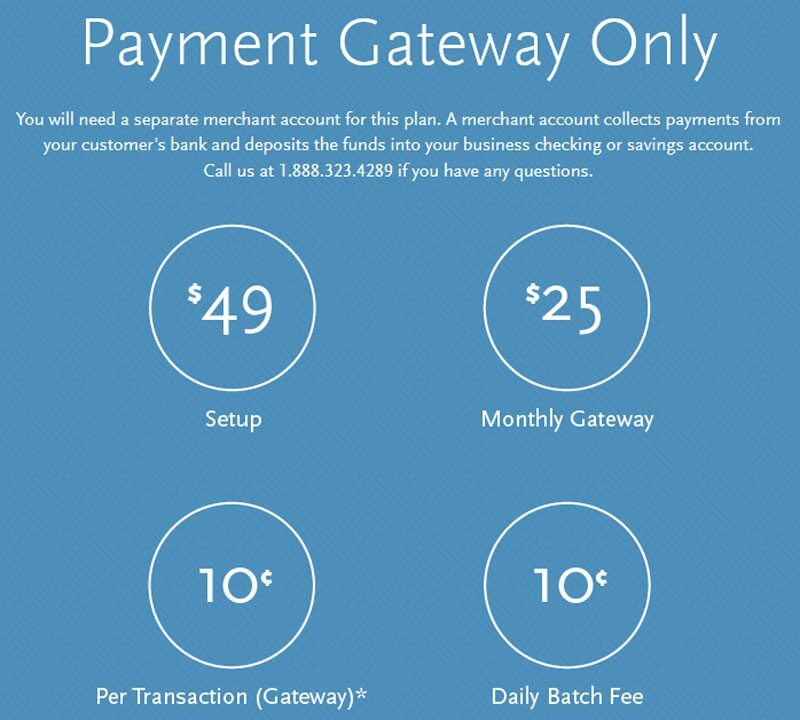 PayPal’s traditional gateway pricing is pretty straightforward, as shown below. PayPal charges a 10¢ per-transaction gateway fee, and credit card processing fees are set by your merchant services provider, learn more about how that works here. Any PayPal payments are run under PayPal’s standard fees. PayPal also offers optional services like fraud protection with added fees, learn more about these here. PayFlow Pro Your merchant provider fees + 10¢ per transaction 2.9% + 30¢ per transaction $25/mo. Here’s a closer look at Stripe’s pricing, and you can find more details here. A rundown of Authorize.Net’s pricing is nearly as short and sweet as Stripe. Of the three, its all-in-one payment gateway solution is the only one with a setup fee. And its monthly $25 fee is topped only by PayPal Pro, PayPal’s highest $30/mo. all-in-one level. Here, Stripe beats both with no monthly fee. Authorize.Net all-in-one costs 2.9% + 30¢ per transaction 0.75 $25/mo. Learn more about the pricing for Authorize.Net’s all-in-one payment gateway solution here. You also get several nice payment gateway security and payment acceptance features at no extra cost. See them all here. If you already have a merchant services account that you’re happy with, Authorize.Net is a good choice since it works with virtually every payment processor and ecommerce platform. If you don’t have a merchant account yet, check out some of Authorize.Net’s payment partners. These providers, which include Payline, bundle the Authorize.Net payment gateway into their merchant services, which can save you money. For businesses that process payments in volume or those needing just a virtual terminal, Payline is a great cost-saving provider with low rates for all types of accounts. Click here to learn more. Authorize.net payment gateway’s ability to be integrated into their payment partner’s merchant services is something PayPal’s traditional gateway service doesn’t do. Chargebacks are an inevitable part of selling online. No matter how well you cover your fraud risk, sadly crooks always seem to find a way to cheat sellers. And sometimes a customer is just unhappy and takes it to their card provider. Of our three, Stripe has far and away the lowest chargeback fee, but PayPal has a pretty nice Seller Protection Policy, as you’ll see below. If the chargeback is decided in your favor PayPal refunds the chargeback fee. But if items are covered by PayPal’s Seller Protection Policy, they cover both the amount of the chargeback and the fee. This is a benefit that neither Stripe nor Authorize.Net offers. Learn more about how PayPal handles chargebacks, claims, and disputes here, and PayPal’s Seller Protection Policy here. Of our three, Stripe has the lowest chargeback fee and refunds it if the case is decided in your favor. Learn more here. Authorize.Net has the highest chargeback fee, but like PayPal and Stripe, it’s refunded if a dispute is decided in your favor. Payment data security is a prime concern for every ecommerce business and small businesses in particular. While all three of our systems operate using Level 1 PCI-compliance, the way they integrate with your online store’s checkout can put less or more security responsibility on your shoulders. Basically, if a payment gateway’s checkout integration accepts payment on its own servers, you carry less responsibility for security on your own system. But if the integration accepts, passes, or stores payment data on your website’s servers, you need to ensure PCI compliance of your entire system. This can be a simple self-review or a daunting compliance task depending on your sales volume. So it’s important to know the level of security your payment gateway integration provides. Here’s what you need to know regarding payment gateway integration security for each of our top picks. Certain PayPal payment gateway services integrate to accept data on their secure servers, others do not. Here’s how they break down, and you can learn more about PayPal’s PCI-compliance here. Again, Stripe provides the easiest answer. If you use Stripe, your data security responsibility is minimal. Stripe only allows fully secure gateway connections in which payment data is entered directly into their servers, period. Every plug-and-play cart integration supports this, and it’s a requirement of custom API solutions. Learn more about Stripe’s PCI-compliance here. Like PayPal, Authorize.Net can integrate with shopping carts in a way that’s fully secure, or in a way that puts more PCI-compliance responsibility on your shoulders. Authorize.Net has secure plug-and-play connections with many top ecommerce carts, so finding a secure solution with Authorize.Net isn’t difficult. 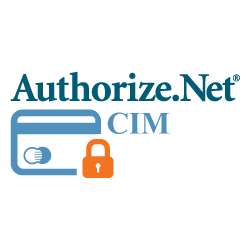 Learn more about Authorize.Net’s PCI-compliance and your data security here. All three of our top picks let you initiate an account in just moments, no review or approval process needed. Each has an intuitive interface and user dashboard for account management needs. Plus, all three plug-and-play with most top ecommerce platforms so even web newbies can set up and sell quickly. Our top picks also provide robust API tools for customized cart connections, but that takes developer expertise. PayPal’s many payment gateway options integrate with virtually every ecommerce platform under the sun. Click here to see them all. Stripe’s 1-click payment gateway integrations with 51 carts can be viewed here. All of Authorize.Net’s many cart integrations are available on this page. This is becoming more important as the online and mobile buying world moves from credit card and PayPal payments. With eWallets like ApplePay and AndroidPay and even new currencies like Bitcoin, the range of payment types a payment gateway and processor accepts can have bearing on your choice. Of our three top picks, Stripe is the clear leader in number of payment types. However, PayPal is still the top payment alternative to credit cards for online shoppers. Of our three, only Stripe doesn’t offer phone support up front. To talk to Stripe, you begin with an email or online form request, then they will call you. In system outage situations, that can be a major hindrance, but not a real game-changer when you consider all of Stripe’s pros. In contrast, both PayPal and Authorize.Net put phone numbers front-and-center on their websites, which is nice when needed. No direct contact phone number. PayPal Our top payment gateway pick for small business offers three all-in-one and two traditional gateway options, and all process PayPal payments together with major credit cards. Stripe Our top pick for a fully secure payment gateway, Stripe offers one all-in-one plan with simple pricing and an industry-leading secure checkout. Authorize.Net Our top traditional gateway pick works with a huge number of merchant services providers plus offers a competitive all-in-one option, too. Square Top-rated POS system for small retailers, to support all types of online and offline selling. Sam’s Club Business Payments This is an all-in-one solution backed by Sams’ and the payment gateway and clearinghouse giant, First Data. Payeezy by First Data A reliable, secure, low-cost payment gateway with real-time payments manager, secure hosted checkout and many compatible shopping carts. Amazon Payments If you sell on Amazon and want to sell on your own site, Amazon Payments can keep all of your services under one roof. PayJunction Another all-in-one provider with terrific payment solutions, support, and rates. This is a great option to consider too. QuickBooks Payments QuickBooks Payments is QuickBooks own all-in-one payment gateway solution and it integrates with several top shopping carts. Braintree A PayPal product, Braintree is an advanced payment gateway geared toward enterprise-level and international sellers. Payza Payza lets users send and receive payments online, transact using bitcoin, credit cards, or bank transfer for purchases, money transfers, and cash withdrawals. 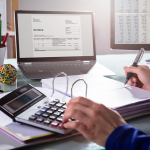 Small business owners are busy people, and any hiccup in a key task, such as receiving and processing online payments, can stop the workday in its tracks. 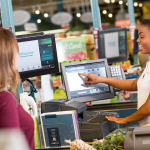 Using a reliable payment gateway that connects seamlessly with your cart checkout is imperative to keep workflow running smoothly. Volusion’s ecommerce software helps you create a website that integrates with many payment gateways, including PayPal, Stripe, and Authorize.Net. Once you’ve carefully chosen a payment gateway and set up your small business website, Volusion also helps you easily manage your online store and market your business. Click here to start a free 14-day trial. All-in-one payment providers tend to cost more at higher sales volumes than traditional payment gateway/merchant services combos. But they offer the streamlined convenience of having all of your services under one roof. Plus, with the all-in-one options offered by our three top picks, you know what your rates are up-front and have few surprises. But with traditional payment gateways offered by PayPal or Authorize.Net, you can use your own merchant service to take advantage of cheaper interchange-plus credit card processing rates. So take your time, talk to several payment gateway providers, and run the numbers. That way you’ll find the best payment gateway solution in terms of cost, convenience, and security for your business. After you’ve found it, create your compatible website with Volusion’s ecommerce software. Have you used PayPal, Stripe, or Authorize.Net, or have best payment gateway in your book? Please share your thoughts and experiences in the comments below. It depends on the type of account, but I don’t think Canadian accounts cost more than US accounts. In the US, Payments Standard is free, and Payments Pro is $30. If you need certain services to connect to your website cart seamlessly, or virtual terminal access you need Pro, thus the $30 account. Also, the PayFlow Pro gateway account can have fees too in case you were talking to them about those. I’m not up on any special charges for Canadian PayPal accounts. I’d call back and ask them if you can just have a free Payments Standard account in Canada. If so, have them explain why they directed you to the $30 account. It might be due to needs that you expressed when you called them (virtual terminal, integration for shopping carts). They’re pretty straightforward in the fees, not many hidden fees with PayPal, but there are things that they charge for if you need a particular level of service. tails reservation contract emails and what ever was on the list stripe recommended, after 2 months the guest card provider who reviewed it decided that its a fraud, now if it was i wouldn’t bother writing this review wouldn’t i, i just want to warn you that even if you have all the necessary evidence your money is not safe and stripe will do noting to help you. I’m sorry that happened to you! That’s frustrating, I know, I had my fair share of chargebacks over the years in my ecommerce company. It’s perplexing to see how often they side with the claimant even when the merchant provides every shred of proof required to back up the charge as valid. Unfortunately, this situation is not unique to Stripe. Most merchant account payment processors are terrible when it comes to resolving these issues fast or fairly. They cave-in to the credit card companies far too often. There is chargeback protection that you can get to protect yourself if this happens often, but if it’s only rarely, the costs may not be worth it. But it’s something to know about. I wish I had better advice but it’s something we all have to deal with when accepting credit cards. I hope somebody will find my comment useful. I am so happy that I have decided to choose Cardinity as my payment solution. It\’s been only several weeks, but I really enjoy working with this service. They care a lot about me as a client. I always get very quick response to my questions (for example, when I had some difficulties in integration, I got very clear guidelines on what to do). Not to mention that my application was approved within 2 days. The best thing is that Cardinity is an all-in-one solution, but the cost is relatively small. Of course at first I was not sure whether I should choose a payment service which is not as well-known as Stripe or Authorize.net, but they exceeded my expectations. I hope things will go on well. Secondly-The Set up fee and monthly payment. I will prefer those options that that requires no set up fee and monthly payment but only have their payment based on % number of transaction coming in. Lastly- Is it possible to have a provider that has merchant account(The business account that hold your fund after settlement between customer and service provider) all included as part of their solution? Try Volusion free for 14 days!